Police in southern Greece have seized a rare twin pair of 2,500-year-old marble statues and arrested two farmers who allegedly planned to sell them abroad for euro10 million ($12.43 million), authorities said Tuesday. Police said two Greeks aged 42 and 48 were arrested in the Peloponnese area late Friday as they were loading the illegally excavated figures of young men into a truck. Authorities are seeking a third man suspected of belonging to a smuggling gang that planned to spirit the 6th century B.C. works out of the country. "This is a very important find, of fabulous value, and (both statues) were ready to be taken out of Greece," Culture Minister Pavlos Geroulanos said. Archaeologists said Tuesday the statues are "outstanding works of art" and may have come from a temple or cemetery in a lost ancient city in the Peloponnese region in southern Greece. Both are in excellent condition, but lack sections of their lower legs and were gashed by a plow or digging machinery. They stand 1.82 meters (5 feet 9 inches) and 1.78 meters (5 feet 8 inches) high, and were probably carved by the same sculptor out of thick-grained island marble between 550-520 B.C, at the height of the archaic period of sculpture. "They are exactly the same, with a slight variation in hairstyle and a small difference in height," said Nikos Kaltsas, director of the National Archaeological Museum in Athens where the finds were temporarily housed for conservation and study. "The artist may have wanted to produce two similar figures that would form part of a group." 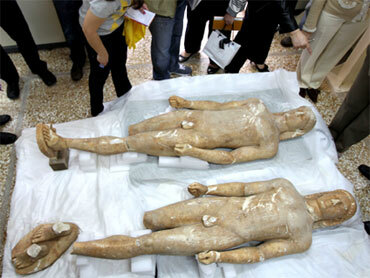 The statues are of the stiff, highly formalized Kouros type widespread in the 7th and 6th centuries B.C. which portrayed gods, heroes or aristocrats and were painted in bright colors. From the 5th century on, Greek sculpture became more fluid and lifelike, culminating in the naturalism of the Hellenistic era. Such discoveries in good condition are uncommon - about three have turned up during excavations in the past decade. But matching pairs are particularly rare. Although the precise spot of the find is still unclear, authorities believe it may coincide with the lost ruins of Tenea, a city that according to ancient writers lay between Corinth and Mycenae and was first populated by prisoners of war brought back by victorious Greeks from the Trojan War - recorded in Homer's "Iliad." A similar, but slightly earlier statue discovered in what may have been Tenea's cemetery is displayed in Munich. Archaeologists hope to find the missing leg sections, because the breaks are recent. Police chief Lefteris Economou said the arrests followed information from culture ministry officials. He provided no details on the identity of the potential buyers or which country the finds had been heading for. Antiquities looting is a major problem in Greece, where treasures - by law all state property - can lie inches below farmers' plows or modern buildings, especially in cities like Athens that have been constantly inhabited for thousands of years. Illegally excavated finds can be impressive to look at, but all the valuable context, which in an organized excavation provides information on their use, date and origin, is lost during hasty looting digs. "Going after antiquities thieves is our main priority," Geroulanos said. "Work has been done in that direction ... and we are starting to see the first major results." Dozens of illegally exported finds have been returned to Greece over the past few years, including four masterpieces from the J. Paul Getty Museum in Los Angeles.